Thank you for visiting the Think Big Partners Blog. In an effort to simplify, we’ve moved this blog in-house to www.thinkbigpartners.com/blog. Feel free to read through our posts here, or join us over on the new blog for the latest news, thought leadership and great advice for entrepreneurs. Thanks for visiting! It’s a core belief at Think Big that entrepreneur is not so much a title, but a spirit. It’s a pulse that courses through the veins of a growing company. We know that behind every great company are people who embody this spirit, people who embrace change, face the unknown and are willing to try new things. We’re lucky enough to have a team of these people, and we’re happy to announce that we’ve named one fearless entrepreneur on our team, Sarah Snyder, as partner. Prior to 2010, Sarah, an event planner at the time, had aspirations of planning the Oscars and working on Disney parades. But it wasn’t until an entrepreneurship conference put on by Think Big that she found her direction. Her passion is events that change people; events that teach them and empower them. “I decided right there that I wanted to make a difference with the events I planned. I began as a volunteer for Think Big, and found myself working full-time not long after,” said Sarah. During her early days at Think Big, Sarah’s major accomplishment was starting the Think Big Coworking community. What started as just “space to fill” has blossomed into an active, engaged and close-nit coworking environment. In her new role as Partner, Sarah will continue the momentum she helped start and has big plans for developing the community further. When asked about what “partner” means to her, she said that partners take care of each other. “Partners help round out the thought process, fit together and create a whole perspective,” she said. 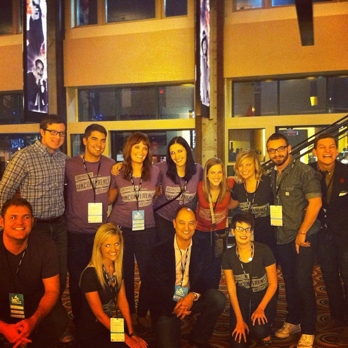 In her day-to-day partner role, Sarah will continue to grow parts of the Think Big business regionally and nationally. 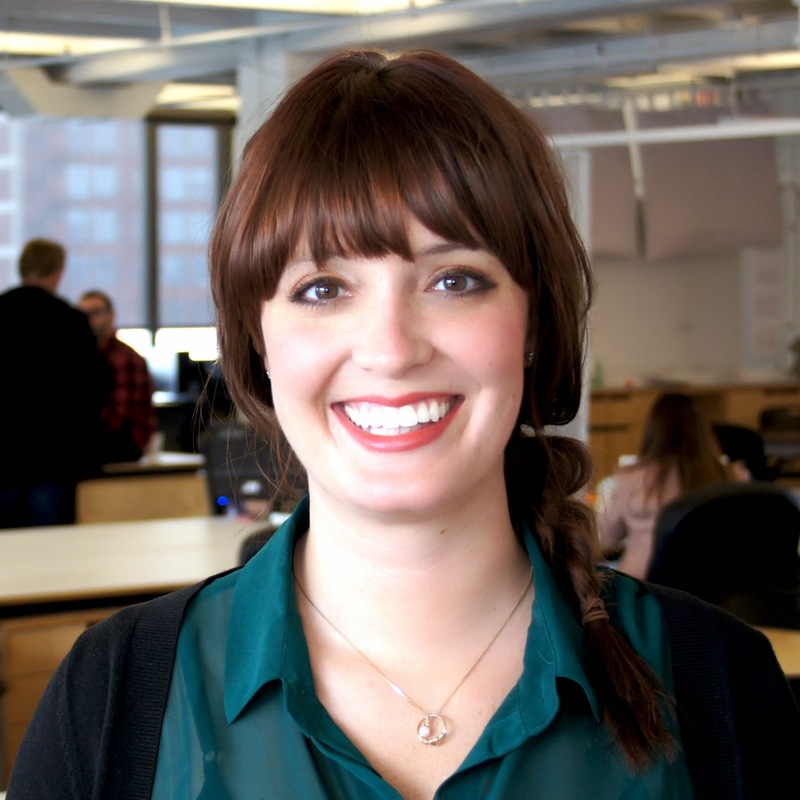 While her major focus is on strategic partnerships, she will continue to manage the Think Big Coworking space. Because she’s been a part of Think Big since the beginning, she’s seen a lot of changes and forward progress. 2014 is going to be a big year for Think Big. Stay tuned for some big announcements from Sarah and the rest of the Think Big team this Spring/Summer. Contact Sarah if you are interested in partnering with Think Big at sarah.snyder@thinkbigpartners.com. The changing of seasons is one of Mother Nature’s greatest inventions. As autumn leaves fall and tree branches begin to bare, it is a natural time to reflect on the year that has passed. It is often during this time, and the natural tendency to slow down as the weather becomes colder, that some of life’s greatest revelations become self-evident. Every year, we start winding down Think Big Partners activities during November, forcing many critical decisions to be reckoned with in December. These decisions will shape our business, both operationally (day to day) and longer term in pursuit of our vision of economic prosperity for our community and country, based on successful entrepreneurship and its many proven rewards. By helping entrepreneurs build profitable companies, bridging the gaps between innovation and commercialization of good ideas worth doing, or maximizing economic growth opportunities for cities based on their rich, unique history of industrial success, we contemplate lessons learned and ways we can work smarter in the future. The process of winding down doesn’t mean we stop working. Work is sometimes an illusion. Being busy doesn’t always mean getting things done. Activity should not be confused with progress, and should not be measured by the number of emails sent, meetings attended or arbitrary tasks checked off your list as completed. But the act of taking things off your list…that is very different. This is, in fact, a productive activity beyond measure. To be truly productive and be able to live a smarter life going forward, we must be willing to release ourselves from our self-imposed obligations of the past. If you take the time to examine things, you often can learn more than you bargained for. It has been said that the truth is already know, it just has to be revealed. Take the time to look for these revelations. Reflecting on the past year, we think we see things in our world of running a hybrid technology focused business incubator, startup accelerator and collaborative coworking space for entrepreneurs a bit more clearly than ever before. Perhaps it is because we have crossed Malcolm Gladwell’s proverbial “10,000 hours” mark of experience for true mastery. Maybe it is because entrepreneurship and innovation seem to be “the new black”, and everywhere you look there are opportunities ripe for observation. Or maybe it is simply because we now look at things just a bit differently, based on our newfound experience and quiet lessons learned along the way. Some of these lessons were quite obvious. Some were very subtle. A few were even painful. But no matter how we arrived at these revelations, all were invaluable. With these lessons, we see things clearer than ever before. We originally launched Think Big Partners in October 2010. But truth be told, we actually started in spring of 2009. It seems like a long 4 years since that time. Back in May 2009, Tyler Prochnow and I took “B” office space and decided to re-learn all the things we hated about starting a business that we had forgotten about over the previous 10 years. Things like waiting for the cable guy to show up in their 4 hour window. Ordering a VoIP phone and not being able to properly hook it up for weeks. The isolation of working nearly alone, where you lack feedback for your ideas and contact with talented, diverse people that can give it to you. We had to tap back into our past forgotten experiences to gain the knowledge we were look for. In 2009, Tyler had just come off the successful sale of Kansas City’s arena league football team (he was the original founder and pulled off a near miracle getting them to launch on time), and I had just sold my interest in a call center that I helped launch. Tyler had been practicing law for the bulk of his adult life, and I had been in the investment space for more than a decade, concurrent to some my career as an entrepreneur. Tyler had won awards and recognition as an outstanding attorney, and I had received recognition for being a co-founder of an Inc. 500 company in the marketing space. And while we had 2 very different backgrounds, we had one common experience. This experience was that it was really, REALLY hard to successfully take a good idea and turn it into a sustainable business. Good ideas are a dime a dozen. That is not to say that it is easy to launch a new venture, but what gets really hard is taking a new venture from bright, shiny enthusiastic object stage to grind it out, not so fun when you miss dinner but must get it done stage. Getting your first 10 customers and your first real taste of revenue is where it gets tricky. And that is the part that we love the most, as we always seem to enjoy a good challenge, especially one that we can keep score in. Our collective experiences, along with those of our immensely talented team members and partners, have equipped us for the next chapter in our book. We are very excited knowing exactly what we need to do, what we need to build and how we are going to execute this game plan. We are grateful for the partnerships we have created, both public and private, that will empower us to be very powerful allies for our entrepreneurs, startups, ideas, commercialization partners, big and small companies, investment partners, communities and country as we go into the new year. These realizations have all come as the result of slowing down, to see things a bit more clearly, and to tune into the wisdom that is all around if you just pay attention. We are thankful for the wisdom we have gained, and more so for the opportunity to do something with it in 2014. Stay tuned…and thanks for reading. The application window for the next class of Think Big Accelerator companies will close on December 6th 2013. As our search for entrepreneurs with passion for taking big ideas and turning them into profitable and scalable companies continues, I sat down with Accelerator Director Blake Miller who addresses some of the most commonly asked questions of potential applicants. Should entrepreneurs wait until closer to the deadline to the December 6th deadline to submit their ideas in hopes of improving their chances? “I definitely encourage entrepreneurs first and foremost to apply when they believe they are ready to build and or grow their business. With that said, we've been evaluating applications and arranging first interviews with founding teams as applications have come in." What do you tell entrepreneurs who are apprehensive of signing up based on the stage of development they're at? What is Think Big's view on submitting multiple ideas? Should entrepreneurs only submit ideas that they think "fit" Think Big Partners? If you have a big idea that is ready to launch and grow, we want to meet you. The application window for the next Think Big Accelerator closes on December 6th, 2013. Interested entrepreneurs are encouraged to learn more about the Think Big Accelerator model by contacting us via email or visiting thinkbigpartners.com/accelerator. Are you ready to take the next step in growing your startup? If so apply for the Think Big Accelerator before it’s too late. The great Greek philosopher Hereclitus is credited with this profound quote about change. Never before has this axiom been more important or relevant for Think Big Partners, or in our opinion, the world of entrepreneurship in general. A recent report by Babson and Baruch Colleges reveals a very thought-provoking statistic: The percentage of adults involved in startups in 2012 hit a staggering 13%. This is a record high since Babson began tracking entrepreneurship statistics since 1999. Looking further at this trend, 56% of adults said they were able to start a business, a confidence level higher than in many other advanced innovation-driven economies. Changes in perspective, attitudes and opportunities have led to more entrepreneur activity than ever before. Beyond this shift in thinking, even more changes have occurred in the world, to include in Kansas City, our home town which we love. When we started Think Big Partners in 2010, there was one formal business incubator program and really no active accelerator program in Kansas City. Today, there are at least six accelerator programs focusing on early stage startups, maybe even more. And if we were to start counting the number of coworking spaces that have sprouted up, the entrepreneur related activity level becomes even greater. Back in 2010, an accelerator was radical, innovative and was a departure from the more traditional business incubator model. Today, there are hundreds, perhaps even over a thousand, of accelerator programs in the world. And likely this number is still growing for a bit longer. The “entrepreneurial ecosystem” is sometimes a strange place. This ecosystem doesn’t always follow conventional wisdom. Hard work is admirable but results are really the only thing that ultimately matter. Commitment is not measured by focusing on your original business plan, but instead by focusing on creating solutions to the original problems which inspired your plan from the beginning. A lack of early formal organization often yields better ecosystem structure later on, even if it doesn’t always feel good at the time. We tell people unfamiliar with the space to accept the disorganized mess that entrepreneurship appears to be, because the big bang theory of successful entrepreneur ecosystems seems to work. Brad Feld, partner at Foundry Group and co-founder of TechStars, has some great theories about this phenomena and talks about startup communities. In talking with Brad (who is a great entrepreneur, wise visionary and fantastic human being), we have listened to his thoughts on how startup communities develop and agree with his underlying beliefs. We believe in Brad’s “Boulder Thesis.” We have seen firsthand, the results of a long-term view led by passionate, motivated entrepreneurs that were willing to take action at a sprinter’s pace but knowing it might be a marathon distance. We love Kansas City’s inclusivity that now exists and see groups collaborating more than ever before for the benefit of the community, the entrepreneurs and each collaborator's organization. Brad’s last point in his “Boulder Thesis” is about creating substantive activities and events in support of the startup community. Think Big Partners is proud that we have been part of the startup and entrepreneur ecosystem for four years now. We are proud of our original event, Think Big Kansas City, which drew 400+ attendees from nine states, that has now morphed into iKC, in partnership with The Greater Kansas City Chamber of Commerce. Our goal was to begin the conversations among all regional stakeholders, and then continue these conversations based on Tony Hsieh’s “collision density” belief system. We have read the book, Triumph of the City, that inspired Tony to take action and have worked to put this belief system into Kansas City (and a few other cities too, that have asked for our help). We have conducted innovation focused events such as The Gigabit Challenge, the Google Fiber-inspired innovation challenge, to Hackovate Health, an open innovation competition in partnership with H&R Block to solve health care innovation problems. Hackovate Health drew applications from all around the world resulting in 10 finalists from different countries presenting their ideas in Kansas City on a very snowy day in 2013. The goal was to foster entrepreneurial activities that focused more closely on product-market fit, or even more specifically, finding solutions matched to problems that had commercialization partners on board from inception. Lastly, we launched our first accelerator program in fall 2012, which has produced companies that have gone on to raise additional capital, win national awards, get invited to participate in other national level opportunities and generate substantial revenue as they bring their solution to the marketplace. We needed to stress-test our accelerator belief systems against actual accelerator experience and our own experiences as entrepreneurs building companies to develop our best model to help early-stage entrepreneurs and innovation partners. With all this behind us, we now look in the mirror and realize the one constant truth: the only constant is change. Maybe it is time for us to look at ourselves more closely. Leo Tolstoy’s quote inspires us to evaluate the world we live in. We are proud of the density of accelerators, the vibrant conversations and the signs of real economic success that now exist not just in Kansas City, but in the Midwest region. We now look at the role we have played and feel we have accomplished part of our original mission to ask provocative questions, encourage new conversations and challenge the status quo surrounding entrepreneurship. We launched multiple experiments to test assumptions we made. Sometimes we were right. Sometimes we were wrong. Often times, we weren’t even right about what we were getting wrong – at least at first. 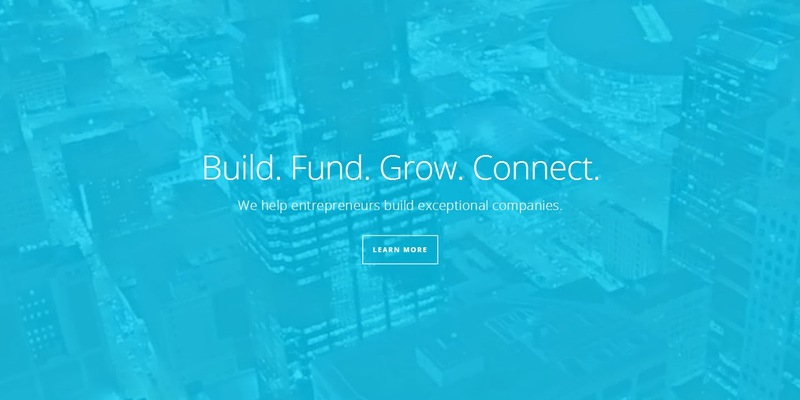 Think Big Partners has always focused on accelerating entrepreneurs, ideas and innovation. We want people who “think big” and who can act as partners in success. We are professionals at helping teams build, launch and scale. In our profession, we have seen the startup statistics play out that point to the fact that teams (versus solo founders) win. Solo founders take 3.6 times longer to reach scale stage and are 2.3 times less likely to pivot, compared to co-founding teams. Teams that are business-heavy are 6.2 times more likely to successfully scale with sales-driven startups than with startups that are product-centric and don’t have these capabilities. Technical teams are critically important, too. Tech-heavy founding teams are 3.3 times more likely to scale than their counterparts that don’t have this experience. Balanced teams that have one business founder and one technical founder raise 30% more money, have 2.9 times more user growth and are 19% less likely to scale prematurely than teams that only have one type of founder in the equation. We realize that many of our most impactful engagements, the role that we play best and the gap that we feel exists most in today’s marketplace, is being more substantive in a “late, early-stage” companies success. This stage is where you need strong technical partners who know how to commercialize technologies (from pilot to full scale production), can combine proof of concept with innovation partnering, and cover blind spots and missing roles along the way to building out an entrepreneur’s permanent team. This role requires talent, discipline, execution, network resources and sometimes capital. Most of all, this role requires time and focus. We like being part of that team. We still see much work to do, but also feel good about the environment in which we live today. Traditional accelerator programs (90 days, 6%-8% equity for $18k-$24k investment) are more widespread than ever before, but there is not enough follow on resources to help those companies once they graduate. We will be part of a founder’s team that needs more substantive help after they have graduated from a good accelerator program or weren’t well suited for an accelerator program to begin with for certain reasons. Think Big Partners has been playing this “graduate” role for many companies for almost 2 years. We are especially excited to focus on entrepreneurs and innovation pathways that realize they have more substantive needs based on their company’s life stage, complexity of their idea or the need for speed without sacrificing precision and execution. We are excited to see how best we can help these types of “later, early-stage” companies and our innovation/commercialization partners going into 2014. Good luck to all the entrepreneurs trying to change the world. We love your efforts, passion and enthusiasm. We hope you will solve real problems with your solutions – and with more support than ever before. The world can be a wonderfully small, productive place when we all work together to help build startup communities that thrive due to collision density and produce results based on the right collaboration of effective resources, deployed at the right time, being available for the right people. We don’t think this is a crazy idea. We think this idea is essential, critical and timely for the world we live in today. Change. It truly is a great thing. 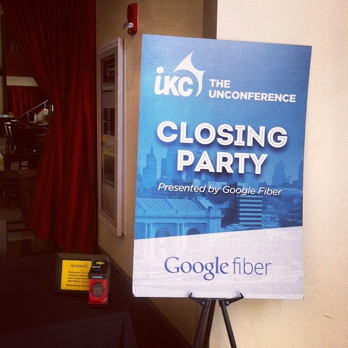 After the innovative unconference that is iKC, attendees headed over to the Alamo Drafthouse for the best part: the Closing Party by Google Fiber! As everyone took their first sips of liquid courage and snacked on delicious appetizers, the Closing Party kicked off with the Open Mic Awards. Attendees awarded each other things like who travelled the farthest for iKC to who tweeted the most about the unconference. Winners walked away with great prizes like Chiefs tickets, bowling games, Boulevard Brewing Company swag and a Garmin watch. After the prizes were handed out, collisions didn’t stop even though iKC was technically over. Closing Party attendees kept having meaningful conversations and interacting, just like they had been at the unconference. 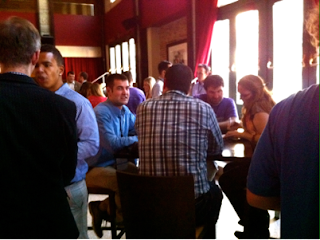 Party-goers snacked, sipped and continued to enjoy each other’s company, forging even more connections to create a better Kansas City. Andrew Stanley, entrepreneur and founder of VolunteerMark, attended both iKC and the Closing Party – and he was not disappointed. But the Closing Party wasn’t over yet! An unconference party isn’t made up of just delicious snacks, drinks and mingling. 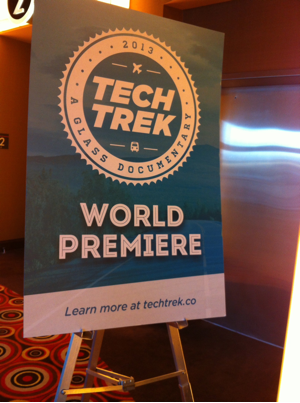 After party-goers had taken their fill, the Closing Party ended with a bang as we revealed the world premiere of the Tech Trek, a documentary made with and about Google Glass. Thanks to support from Hallmark and Sprint, the Tech Trek took Closing Party attendees on a 30 minute journey from Kansas City to Silicon Valley and back to KC. The documentary took note of the good and bad of Google Glass, including commentary on the many reactions people had to the new technology. The Tech Trek made all of us think more about what the Glass technology means for not just the tech industry, but the implications for tech in Kansas City. In a day filled with collisions and innovation on behalf of the great city we call home, we couldn’t think of a more perfect ending to the Closing Party for iKC2013: the Unconference. The decision to make iKC 2013 into an Unconference was done with one central goal in mind; to increase Kansas City's collision density. Over 250 attendees filed into H&R Block’s World Headquarters to tackle the issue head on by creating unlikely collisions in a conventional setting. What took place throughout the day can only be described as special & unique. After a brief welcome from Jason Houseworth, President of Global Digital and Product Management at H&R Block, the iKC 2013 Ambassadors, and Ed Wilson, Partner at Husch Blackwell, our own Herb Sih took to the stage along with event staff, Sarah Snyder and Christine Murray, to lead the live agenda creation. The Unconference format allowed attendees to put their day into their own hands simply by voicing their opinion on ideas for topic submissions. From there, attendees swarmed into the common area to vote on ideas and create the final agenda. The final product was an amalgamation of ideas and questions posed by iKC 2013 attendees. A conference agenda truly unlike anything else; created for the people, by the people. Attendees engaged in sessions that mattered most to them; resulting in mutually beneficial collisions and conversations for both individuals and the collective group. 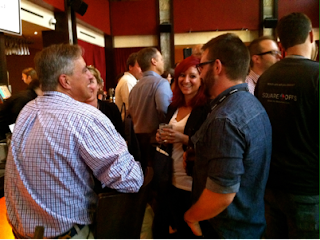 The design of the Unconference format proved to be just as beneficial to fostering collisions as the sessions were. In fact, many conversations often extended past the end of a session and continued into the hallways. By the delayed end of session 4 it was clear that the goal of iKC 2013 was reached. Not only a high quantity of collisions took place, but collisions were extremely high quality as well. 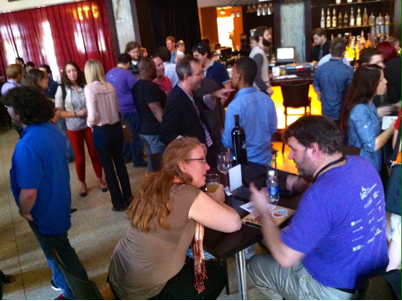 In proper Unconference fashion, the collisions continued on over to the closing party at the Alamo Drafthouse. We are very proud of the success of iKC 2013 and want to thank our partners with The Greater Kansas City Chamber of Commerce for the hard work and dedication they put into the unconference. We can't forget our gracious sponsors, and most importantly our team of volunteers, ambassadors, and UnMentors who made iKC 2013: The Unconference the valuable experience that it was. Check-in starts at 8:00am. Check-in at H&R Block World Headquarters on the first floor (and come early to guarantee your free t-shirt!). Welcome presentations will begin at 8:45am. From there, the day will be divided into 4 sessions (to be determined the morning of the unconference). The agenda will be voted on and created live from 9:30am-10:30am. This hour may seem a little chaotic, but it allows plenty of opportunity for collisions and conversations to happen! Attendees will be able to submit ideas for session topics as they arrive and register. Free parking is available in the Annex Garage off 13th & Grand (but you must print a parking voucher beforehand!). Attendees can make the unconference whatever they want it to be. We suggest having an open mind and to be prepared to discuss, learn and contribute to conversations happening. Attendees have the opportunity to get facetime with some of the leaders of Kansas City by applying for the UnMentor Program. Apply here. Walk over to Alamo (1400 Main) after the last iKC session for the Closing Session, brought to you by Google Fiber. Your iKC ticket doubles as your free pass to the world premiere of Tech Trek at 6:30pm at the Alamo Drafthouse during the Closing Session. You have the chance to participate in the Open Mic Awards and personally recognize and award another iKC attendee on their participation and ideas during the Closing Session. Whenever it starts is the right time. Whenever it is over, it is over. The people who come are the right people. If you are not learning or contributing, it is your responsibility to use your own two feet to find someplace where you are. 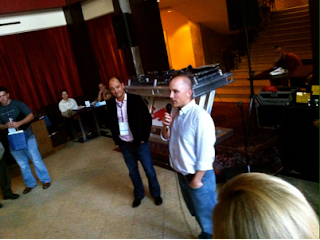 iKC 2013: The Unconference wouldn’t be possible with our great sponsors. A big thanks to H&R Block, Husch Blackwell, Garmin, Mazuma, Sprint, Red Bull and Google Fiber. We can wait for iKC 2013 and hope you’re just as anxious as we are! Three and a half years ago, I didn’t quite know what I was getting myself into. As a recent college graduate, I knew I wanted to go into copywriting, but I wasn’t sure where to begin. So, I took an internship with Think Big Partners as a copywriter, producing blogs and evergreen content for the new company in Kansas City that was “still trying to figure out what it needed to be” in order to serve the Kansas City entrepreneur community. I was completely unaware that I would fall in love with entrepreneurship, startup marketing and perhaps most of all, the people who make it all happen. It was also three and a half years ago that Herb Sih (the co-founder of Think Big who became much more than a boss, but a partner and mentor) asked me what I wanted to be when I grew up during my initial interview. My response has changed from “creative director” to “marketing director” to “agency president” (and countless other titles) throughout the past few years. The Think Big Partners team (and Inboun team) helped me inch closer and closer to my career goals through countless hours of mentorship, collaboration and team pow-wows, and perhaps more than a few happy hours. But one thing was always for sure: in order for me to really become “what I wanted to be when I grew up”, I needed to continue to expose myself to different marketing challenges, discover what it’s like to be at a global marketing/advertising agency and take the necessary stepping stones to develop myself professionally. And so, in order to achieve many of my career goals, I have made the very difficult decision to take my copywriting and marketing expertise from Think Big Partners and Inboun to a global marketing and advertising agency here in Kansas City. I am thrilled about the opportunity to grow myself as a content strategist and marketer, but at the same time, it is always difficult to say goodbye to the role(s) and team that I love so much. It has been an absolute pleasure helping Think Big Partners grow into the “idea factory” that it is today; not to mention, building Inboun into a one-of-a-kind content marketing agency from the ground up. I couldn’t ask for two better opportunities. I cannot thank my partners, friends and family enough for supporting me throughout the past three and a half years at Think Big Partners and Inboun. But most importantly, I have to thank the Think Big team for putting up with my loud typing, overly-competitive attitude, and Pirates of the Caribbean obsession throughout the past few years. I am not sure if there is another team quite like Think Big Partners out there--it has been amazing surrounding myself with people who are truly changing the world. And so, my 867th blog post for Think Big Partners is a farewell blog. I want to personally thank the entire Kansas City startup community (and Silicon Prairie region) for allowing me to be a part of your professional lives. I am sure we will see each other again--and I cannot wait to see the amazing things that you all do in the next few years. Please keep in touch by emailing me at allisonlway@gmail.com or tweet me at my new professional account @AWayInKC (starting Friday; until then, please use @AllisonThinkBig). One the best (and worst things) in working with extremely talented and highly motivated people is knowing that they are“extremely talented and highly motivated people”. At Think Big Partners, we view “human capital” to be our most precious resource. In working with entrepreneurs, founders, corporate innovation teams, investment funds, communities, cities and more...it is always about the people. And throughout the past 3 years, we have found one very important common denominator to our company’s success - goals. It is all about knowing what goals we are trying to achieve, for ourselves and others. Think Big Partners is very big into goal setting. In fact, every employee that we hire must write down their personal and professional goals, as we find it very hard to distinguish where one’s passion for work begins and one’s passion for life ends. To us, while work and personal life are distinctly different, it has many of the same traits that define success. We do not live to work, we work to live, but we want to do so with purpose, pride and passion. It is with this attitude, combined with goals, talent and motivation, that I feel someone can truly make a difference in the world. It may sound corny, but we truly seek people who want to be the change they wish to see in the world. It is with both sadness and joy that Allison leaves us to go on to the next step in her life long journey of the pursuit of personal and professional excellence. With all this said, I am not completely surprised this day has come. Knowing you work with extremely talented and motivated people means accepting the reality that the world is a big place, and for them to make a “dent” (difference) in the world means that sometimes they must leave. But we also believe the world is a very small place. Just because people no longer work for the same company, it doesn’t mean we stop cheering for them. We need the world to be a small place to continue to make a difference in the world…apart but philosophically still together. True, meaningful relationships are based on being partners in each other’s success. That has always been a driving force behind the Think Big Partners brand. We are looking for partners, not employees, vendors or clients. We want to partner in other people’s success while allowing us to be successful for our families. We live that belief every day. Allison - thanks for being an extremely talented and highly motivated partner. Go make your next “dent” in the world. You have made a dent in ours, and we are grateful. Good luck pursuing your next goal, keep in touch and let’s make sure the world remains a small place as we all continue to try and make a difference. iKC: The Unconference...No Agenda. No Panels. What Fun! Hot, emerging metropolitans with business activity focused on innovation and entrepreneurialism, such as Kansas City, are not overnight sensations. Rather, they are the result of years of investment in time, money and hard work. Here in Kansas City a vibrant and dynamic business ecosystem has been evolving for some time now; one that is sustainable and diverse, representing a unique synthesis of Silicon Valley innovation and Midwest values. iKC: The Unconference is an open format conference focused on increasing “collision density” in the region. By creating “serendipitous collisions,” which organically introduce innovators, entrepreneurs, investors and connectors to each other to share ideas,great things will happen. Here in Kansas City, we do not need to ask for anybody’s permission to be successful. As a venue for peer-to-peer learning, collaboration and creativity, iKC helps serve as part of a broader catalyst by helping to attract, support and sustain the types of resources, and talent, necessary for our healthy business ecosystem; a complex blend of industry, academia and capital investment. Recent events such as the Forum at the Middle of the Map Festival, Big Kansas City, Tech Cocktail, iKC and many others convene companies of all sizes and sectors to exchange their ideas and spark inspiration. 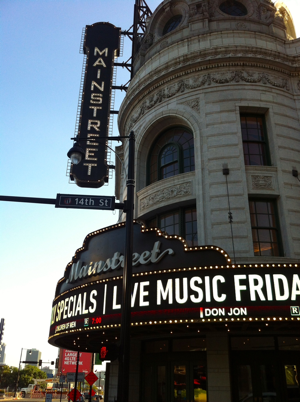 These events also exemplify Kansas City’s evolving business ecosystem and unique approach to business. It is no longer sufficient for one company to lose at the expense of another; we believe that the exchange of ideas, creativity and innovation will lead the way to the future. Trust and credibility. iKC is an opportunity to remove social barriers and turn a random discussion into a business opportunity. Be bold! The rate of innovation increases when success is mutual. We versus me. You cannot innovate alone. Have the humility to seek out long-term, win-win collaborations with others. Pay it forward. This phrase says it all. Mentor, share your knowledge, extend your network, share your ideas; your reputation will be the better for it. Listen. Ask questions and learn from those around you. You cannot hear the next great opportunity knocking if you are doing all the talking. Start from a position of “yes!” Not all ideas will pan out; however, the fear of failure is the fear of innovation. Contact Think Big Partners at info@thinkbigpartners.com or 816-842-5244. What Can the Olympics Teach Us About Startups? We reserve the right to publish only the comments we find relevant and appropriate to the conversation. Copyright 2011 Think Big Partners, LLC. Simple theme. Powered by Blogger.